Last race of the season - definitely not for the faint hearted. The Cheakamus Challenge is a 45 mile race starting in Squamish, BC (Canada) and ending in Whistler, BC. Yes, driving the car along Highway 99 is long enough, taking around 40 minutes, and yes, it climbs all the way. Now picture doing this on the singletrack and doubletrack either side of the road and you take a little longer, climbing around 5000ft. Driving up to the race the day before, it was pretty depressing - rain, turning to full on squally storm. It did not bode well for race day. I really wasn't looking forward to another BC mud fest, and certainly didn't want to finish the season this way. However, that night things began to clear up and by the morning we even had some patches of blue sky - the Cheakamus would live up to it's reputation of clear weather! Big relief! This race has always been a hard one for me. So late in the season (technically it's the start of 'cross season) I'm always tired, mentally and physically. Having started back in February it's just a long time to keep going. 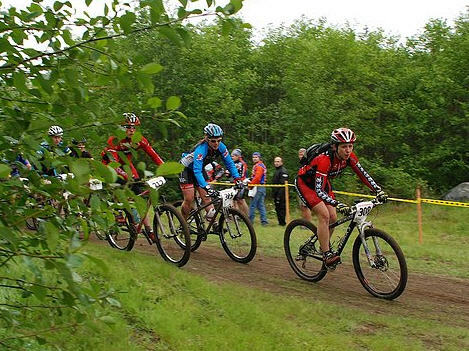 I've raced this race with flu one year and Giardia another - I don't recommend either. This year, I was determined that I'd at least be mostly healthy going into it. It was touch and go for a while as last month I got another bout of Giardia (same infection? New infection? I don't know....) A good dose of drugs and some time off the bike sorted me out mostly, but I was really worried about having lost fitness over that time being down. This would be a real test of my only way to make this up in a 'crash' training programme - pretty much go hard for a week, take a week off then race. Not my usual 'tapering' regime. I think with the experiences of the last year I was in a good position to meet these goals, and I'm pleased to say I did. I kept a steady pace from the start, not going out too strong and fading later (thanks Cascade Cream Puff), and had strength left to tackle all of the climbs through to the end. No pushing due to shear exhaustion! As they'd added a trail from last time I wasn't sure if I'd beat my time, but somehow I managed to pull 10 minutes off, finishing in 4 hours 31 minutes. This was enough to put me 4th women across the line. I was happy :) I would have been happier if I hadn't found out later that that also put me in dead last. Only 4 pros finished the race in the end so not only was my last race of the season a complete success it was also a complete failure! Ah well, you can't have everything right? That's why I'll be back next year! Cascade Cream Puff – A Piece of Cake? So exactly what does a 100 mile mountain bike race with 18,000 feet of climbing take? Race Start - 5:15 and it's still dark! I think I preferred being on the bike! A Little Race with that Lettuce? Most neighbors lean over the fence and try to irritate you in some way. Not mine. My neighbor (John) leans over the fence and tempts me with something I can't resist. No, I'm not talking about the succulent lettuce (that would be Ellen), but a tantalizing race. The MTS Relay to be more specific. He seems to think that the 'miscellaneous' odd balls that live next door to each other at the end of a dirt road on the outskirts of Duvall can pull off a team relay event - 100 miles in one day - From Hyak in the Cascade mountains, through the Snoqualmie Valley, up the Sammamish River, around Lake Washington, and finally through Seattle to Golden Gardens, next to the Puget Sound. I didn't think there would be much stress to this race, because I originally thought it was going to be 'just for fun'. Oh how wrong could I be........ Things began to morph into something more serious when we tallied up the times we thought we'd be able to do and began to realise that we actually had a shot at podiuming. Now the pressure was beginning - we all worked really hard to get to know our legs and knew what times we needed to be contenders rather than just participants. I was beginning to regret the decision to race in Winthrop (a 5 hour drive away) the day before this relay because I really needed to be fresh to give my team the best. I couldn't drop the Winthrop race because it was part of the Indie Series, yet I also didn't want to let my team down. My portion would be the 50 mile road section. Seemed like a good idea at the time (when it was 'just for fun'), but not when I'm literally walking around in a daze completely and utterly exhausted after a demoralizing race (see weak legs in Winthrop below) and long drive home. I managed to stagger across to John and Ellen's to pick up my number plate for the next day and somehow I end up being fed tasty pasta - must have looked like I needed it. I collapsed into bed and hoped things would feel better the next day. I awake the next day to pouring rain - things aren't looking any better and I'm still exhausted. I'm beginning to panic because I haven't raced a road bike in a very long time. I'm going to be the weak link in the team. Will the supply of lettuce dry up? As much as I want to go back to bed and bail on the race, I somehow find my way out of the door and up to Rattlesnake Lake. I'm committed to the team and I won't let them down. On the drive up to Rattlesnake Lake the rain actually eases off a little. I park up and get my biking gear together. I set the trainer up to warm up on. I like sitting on the trainer spinning my legs out - kind of feels good. I start focusing on the race. I have one plan and one plan only; find a big guy a stick on his wheel as long as I can. I'm even eyeing guys up in the parking lot to assess how good a wind block they would be! I take my position in the transition area and wait for Anna to come in from the mountain bike leg. The leaders come through and a flurry of excitement goes through the transition area with muddy mountain bikers looking for their roadie team mates to hand off to. Most are pretty smooth, but a few are running around trying to find their team mate - they weren't expected through so soon. I'm beginning to forget how tired I am and can't wait for Anna to come in so I can get going. It's not long before she comes flying in - just over an hour (yes, 23 mph on gravel IS possible Anna!) No time for pleasantries or 'I told you so' - we touch and I'm off. The road section starts on the fairly step descent of Cedar Road - it's slick from the rain, so I'm cautious descending - it's a long way to go with road rash. Racers go off at different times depending on when their team mate gets in, so we are pretty strung out in the race. A few packs for drafting begin to form, but they are typically a rag-tag bunch that fall apart on any of the climbs. I fall in and out of some of these groups and begin to settle into my own rhythm. I soon sense a racer coming up behind me about to pass me. Now in a mountain bike race I'd be stepping up the gas to stay ahead. In this road race I stepped up the gas, but allowed the pass to in order to slip in behind. I didn't know it until I looked up, but I had found my 'big guy'. This was the guy that was going to be my saviour and was going to pull me to the end. I thought that all I'd be capable of was hanging on for dear life. It turns out that we are pretty well matched and I save a little of my pride by taking some pulls up front. We work well together and start looking out for each other - pointing out things like pot holes, rough road surfaces, turns, red brick roads, cars. We stick together, knowing that together we'll go faster than on our own - it's a silent agreement that can fall apart at any time, if one of us begins to flag and can't keep up the pace. The partnership is self serving, not out of sympathy. Time passes really quickly and we make it to the end together. After completing 50 miles in 2 hours 2mins I'm funneled into a mass of eagerly awaiting kayakers. I have no idea how I'm going to find John, but it turns out that I don't need to. He's there, almost plucking me off my bike to make the run to his kayak for launching. Now therein lies the problem - running. Legs that have been doing a repetitive motion for the last 2 hours don't like change very much. Running is a tall order. I hold onto John for dear life as he literally drags me to his kayak. It's more of a stumble than a run! I somehow manage to launch John in his kayak without spilling him into the river. He's off. I'm done. It's over. I'm happy. Anna is there to pick me up. She's already beaming because her leg is over too and we've set the team up for a good time. Stop number 6 for the Indies Series was in the stunning Methow Valley. Conditions couldn't have been more different than last weeks race in Squamish - hot and dry - not a drop of mud to be found. A biker's paradise! I was not feeling particularly zippy going into this race. Maybe it was not fully recovering from the Test of Metal. Maybe it was the cold that I'd picked up from work that week. Maybe it was missing my greatest supporter (Chris) who'd been away all week. I truly did not want the 5 hour drive across the mountains and if it had not been part of the series I think I would have skipped this one and sat at home and consumed vast quantities of chocolate. The only good thing I can say about my performance was that it was consistent. Unfortunately, it was consistently crap! My legs didn't want to work from the very beginning to the very end and my 3rd place was really only because I was willing to persevere with the humiliation until the end. Now I have recovered a little from my ordeal during ToM, I can begin to laugh at the stupidity of it all. Check out this YouTube video of a section of Crumpit Woods near the end of the race. ToM (Test of Metal) seems to have become a yearly pilgrimage for me. For most, it's more of a personal challenge than a race, and I seem to have become fixated on bettering my time each year. The premier Canadian epic race, tests not only a racer's physical endurance during the 67 km and 4000ft of climbing and skills during the technical descending, but also their mental ability to cope with the particular challenges on that specific day. This year it was rain. To be specific, lots of rain. To be more specific, lots of rain that turns the trail into a goopy, sloppy, mudfest, more suitable for the sport of mud wrestling than mountain biking. We awoke on the Saturday morning to rain and heavy clouds. Even if the rain stopped we knew the trails were going to be a mess. The rain didn't stop. At the start, Robyn and I were not impressed by the prospects of the day's race. For me, starting with the pros made a huge difference to early placing. I was ahead of the starting chaos of 800 racers all trying to get a good position and didn't get held up by overly enthusiastic races who bonked after the first 20minutes after entering the first singletrack climb. By the end of the first lap into the feed zone I was right on target with my timing. My 1:30 would have me on target for my desired 3:30 finish time. Although I was drenched through and covered in mud, the rain hadn't bothered me too much and Chris was there with an almost perfect bottle hand-off. I was a little confused as to why he was trying to hand me 2 at once though. It's always a thrill going through the feed zone (AKA the power house party). The fire road climb is literally lined with supporters cheering and encouraging and the buzz is almost as good as a Gu for an instant energy burst. The energy boost is short lived though because soon enough you are on your own facing an hours climb on the infamous "Bonk Hill". Usually I take the hill climb as an opportunity to pass others. I should have known something was amiss when this didn't happen. I didn't exactly lose ground on the climb, but I didn't gain any spots either. By the top of the climb I was pretty spent, and during the descent down "Big Ring Rip" I started feeling the effects of the cold on my rain soaked body. By the end of the 20 minute fast descent I couldn't feel my hands and braking was hard. I was beginning to get a bit crampy in my legs and didn't feel particularly co-ordinated. This was not a good way to enter 'The Plunge" - the most technical portion of the race, that can be hard to clean in dry weather. Add in copious quantities of mud and you can have some tricky situations. 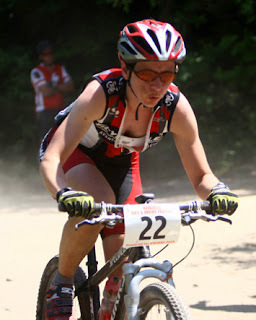 I wasn't especially pleased with my performance, but at least I stayed on the bike (mostly.) Unlike a lot of other racers who chose to simply dismount and run. I shouted a lot to get them out of my way, but even so, I got held up here trying to pass. Heading back into the feed zone I was 7 minutes off my target and knew I wasn't capable of making it back up on the next section through Crumpit Woods (AKA Crampit Woods.) I consoled myself with 'every one's going to be pulling worse times' and headed into Crumpit. I was still cold, and beginning to get a headache. I just wanted it to be over. But it just went on and on, seemingly never ending. I just wanted it to be over. Nothing left inside me, I added another 11 minutes to my time deficit and to rub salt into the wound got passed by another gal that I just couldn't stick with. If I'd had anything left I would have allowed her to lead into the finish and take her close to the line. Not even close! I finished up in 3:48 - 18 mins off the time I wanted, and 9 minutes back on last year's time. I was covered in thick mud, had a raging headache and wandered around in a thick haze waiting for Chris to arrive to be able to change out of my wet clothes. The only consolation was that I did finish and it was good enough to get me an 8th place - right around mid pack. Not bad, but not good either. The next day I felt like I'd been rolled down the mountain rather than I had ridden down. Pretty much everything hurt. I hadn't enjoyed the race and didn't feel pleased with my performance. So what am I going to do about it? Yep, you guessed it, go through it all again next year, in my sick quest to beat my personal best once again. How can you pass up the opportunity to race a race that ends in a beer garden? Maybe when the race starts at noon and the temperatures are heading towards triple digits, and you really don't need a beer to give you that 'light headed' sensation. 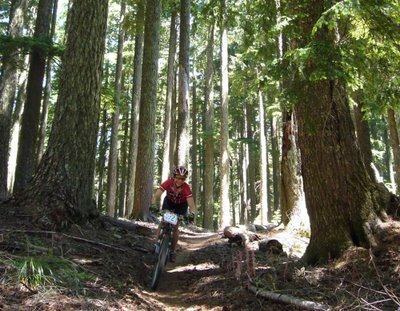 Leavenworth, our very own little Bavarian town in the heart of the Cascade Mountains, is home of this tempting combination of sports - racing and beer drinking. I was vaguely disappointed that no one was wearing Lederhosen for the race. Somewhere on one of the three 1800ft, 4 mile climbs I do believe I heard a strange sound, no, it was not far off yodeling, it was the sound of boiling brains (mine to be more specific) - well maybe not quite boiling, but at least a little light poaching. Or was it beer being poured in the beer garden? No, that wasn't going to start until later.... Wait, maybe I'd been out so long it had already started. No, better to believe that my brain was poaching itself. Thank God it wasn't yodeling. I lost my lead near the end of the first climb - Kristi kicked it up a notch and I just couldn't stay with her. My heart rate, already in the 190 BPMs just didn't have anywhere else to go. I also hoped that Kristi was making a mistake and would blow up later. She never did, I lost 4 minutes to her. She obviously needed a beer more than I did! Another new one for me today. Super D (downhill) is a less technical, longer version of a downhill race that still requires pedaling as there are a few ups as well, so no big bikes required. In fact my hardtail was plenty adequate on today's course. We set off at 10 second intervals on a double track gradual descent. Pretty soon I was pushing the highest gear I have (not sure I've ever been in my big chainring for that long!) Near the end, a few uphill kickers finished off the punishment. I was very surprised that I managed to stay anaerobic the entire race. Heart rate averaging 185, peaking up at 198! The only tricky parts were negotiating the sandy/pea gravel areas and not wiping out on the corners. Knowing I still had the main XC race tomorrow, I played it safe, wanting to finish without injury to me or the bike, so took it conservatively. I finished in 21:04 for this 6 miler and that put me 6th overall. Only one gal in my age ahead of me, so we'll be battling it out for the overall GC tomorrow. I'm only just beginning to get used to the sunshine here - blue skies, warmth, not having to wash down the bike every ride. I like it! Yesterday was the Time Trial - a 6 mile all out loop. Racers going off every 30 seconds. Trying to catch the person in front and not being caught be the person behind being key. My race was due to start around 1:30, but I didn't go until 3:15. That's a long time to wait around for the start of your race. I tried to keep in the shade with my feet up, but when you are expecting one time, and then it turns out to be another, it gets had to stay relaxed. My time comes eventually and it hits me hard. I've not done a hard effort for about a month now. With a trip to Hong Kong and then getting sick this is a shock to my recovering body. I give it everything, catching glimpses of the gal in front of me, doing everything to keep the person behind from catching me. Within a few minutes my mouth is dry and and my lungs feel as if the hot air is searing them inside. I wonder why I do this. About half way through I'm gaining on the gal in front, I pass her quickly. Another gal in front now, I pass her close to the end. There's a gal closing in behind me but I hold her off until the end. If she's in my class I know she will have a faster time than me though. How did I do? Hard to tell as I have to wait for everyone else to come in and for the results to be posted. 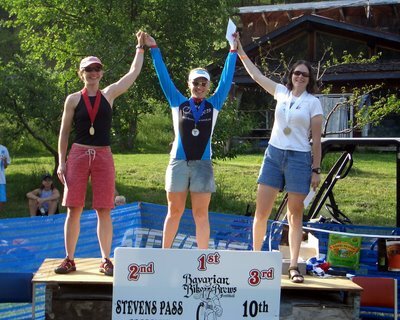 Turns out the gal behind was a different age, and I did just enough to take the win in the 30-39 age category. This surprises me - it's my first national win! My time of 27:41 has given me a 10 second lead on my competition going into the Super D. Can you say 'target'? I'm beginning to wonder if I shouldn't re-name this blog 'Confessions of a Rain Diva'. Headed down to Portland last Sunday afternoon to meet Sue for our big 3 week racing/training adventure. The basic plan was to drive to Arizona for the NOVA National NMBS Race being held the following weekend, race, drive to LA for some sunny training time and then on up to Monterey in California for the Sea Otter Classic Race. What's a couple of thousand miles on the clock if you can go ride in the sunshine? The drive through California and onto Arizona was uneventful, boring, and yes, you guessed it, followed by rain clouds. We arrived at Paul's house in Fountain Hills (just outside of Scottsdale) late that night and were happy that the 20+ hour drive to get to our destination was finally over. We slept well. Paul is a 'snow bird', living in Arizona during the winter and Portland during the summer - catching the best of the weather in both places. He'll likely head back up to Portland in May before it gets too hot in Arizona. Paul's cache of bikes in his garage made Sue and I feel quite at home. In his mid 60's he's still out most days either on the road or the trails. The next morning he showed us a trail to get to the race course - a rock strewn fun twisty trail that made me wish I'd brought the Epic full suspension bike rather than my hard tail. We learnt not to go near the sharp pointy objects lining the trail (they call them Cacti) and to avoid the small green balls that had fallen from said cacti, that were in fact land mines waiting to blow up your tires. The terrain is very different here! Wait, there's something missing - where's the mud and rain? This can't be right. Have I finally gone far enough South to be safe from the rain? 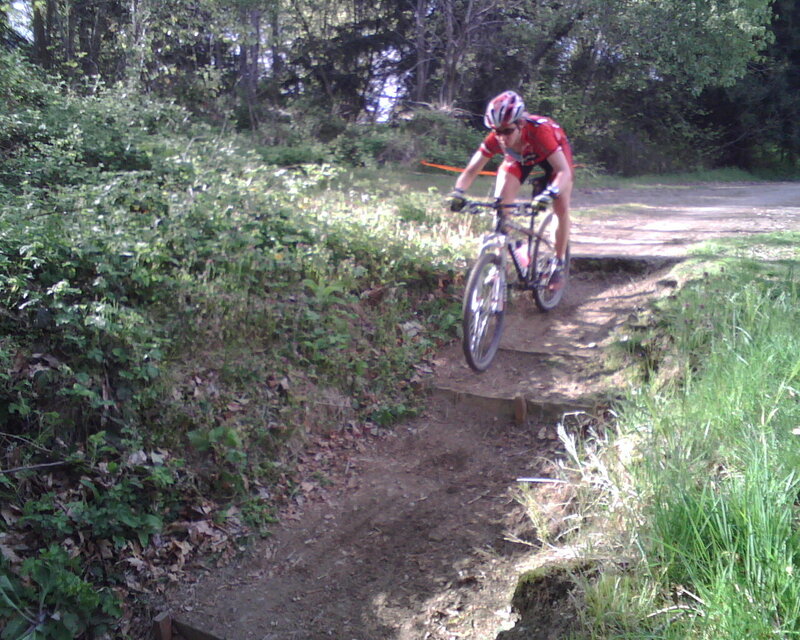 We got to pre-ride the XC course a couple of times, and it's way more fun than I was anticipating. Some smooth rollers, some short drops into bowls, some rocks and lots of twists and turns. Nothing majorly technical, but enough to keep you on your toes. No major climbs or descents. I'm looking forward to it. Ended up being out for 5 hours (a little longer than anticipated) and I was a little beaten up on my hard tail by the end of the day, but had a nice bid grin on my face to go to bed and sleept well for the next day of pre-riding the Time Trial course. 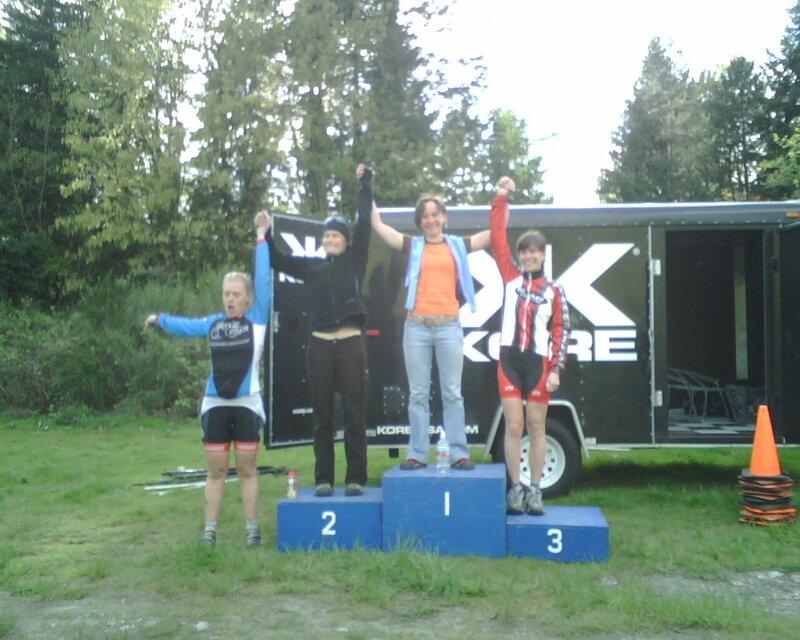 I specifically avoided the 'cross season this winter because I was fed up with racing in the cold and wet. So what happens in the first MTB race of the season? Yes, cold and wet. The race is early in the season, but in previous years it's been anything from vague drizzle to full-on sunshine. This year, it looked to be more of the same on the weather forecast but when we got close to the course, we noticed a distinct sprinkling of snow on the ground. At the start/finish area there was about 4" of snow, mixed in equal parts with the rain now falling and the churned up mud. Temperatures hovered at just below freezing. We got there early as we wanted to watch the beginners go off - Paul, a friend and long-time riding buddy was due to enter his first ever race, and having watched him suffer over the years, we wouldn't have missed it for the world. Because of the conditions, they delayed the start for an hour so a whole bunch of beginner riders got to sit around getting colder and colder. Of course, Paul's team brought a honkin' great RV with them, so they weren't affected by the weather at all. It made our little canopy tent look a bit flimsy. The beginners went off without too much fanfare - I think it was just too cold for people to be enthusiastic. It was immediately obvious that the conditions would be unpleasant as the field raced away through hub-deep puddles. The Tahuya course is one big loop, so we didn't see the riders until they crossed the finish line (one lap only for beginners) - and Paul came across in second place for his category! He was numb from the cold and had only one warning - stay high on the bermed corners, or else you'll sink. Now it was the experts' turn. I raced Open category (cash prizes! 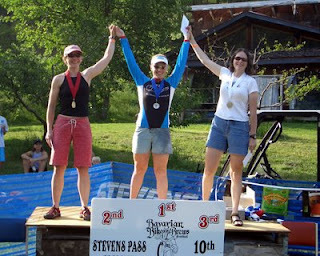 ), and three other Ti Cycles women were on the start line with me. The beginners had one lap; we had three! After grabbing pole position of the line, I decided to take a different route than everyone else (no pre-ride, it was just too cold) and had to re-join the field in fourth or fifth place. This didn't prove too much of a problem as most of the group had real problems getting traction on the climbs, whereas for whatever reason (full suspension? tire choice?) I could stay on my bike. By the end of the first lap, I had a minute's lead, and this was enough over subsequent laps to win the Open category. 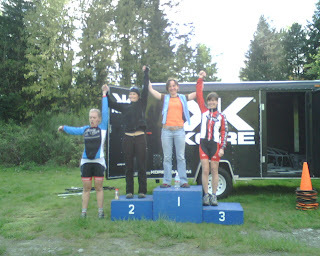 Unfortunately, some of the other women had mechanical issues or just plain cold issues, but Jitke took 5th in Open, and Michelle took 4th in Expert for Ti Cycles. Not a bad showing for the first race of the season.